This tutorial is designed for you to gain a basic understanding of the DJI Mobile SDK. It will implement the FPV view and two basic camera functionalities: Take Photo and Record video. We use Mavic Pro as an example to make this demo. Now, let's create a new project in Xcode, choose Single View Application template for your project and press "Next", then enter "FPVDemo" in the Product Name field and keep the other default settings. Once the project is created, let's delete the "ViewController.h" and "ViewController.m" files created by Xcode by default. Create a new ViewController named "DJICameraViewController". Now, let's install the DJISDK.framework in the Xcode project using Cocoapods and implement the SDK activation process in the "DJICameraViewController.m" file. If you are not familiar with the process of installing and activating DJI SDK, please check the Github source code and this tutorial: Importing and Activating DJI SDK in Xcode Project for details. 1. We use the FFMPEG decoding library (found at http://ffmpeg.org) to do software video decoding here. For the hardware video decoding, we provide a H264VTDecode decoding library. You can find them in the DJIWidget/DJIWidget/VideoPreviewer folder, which you can download it from DJIWidget Github Repository. In the setupVideoPreviewer method, we set the fpvPreviewView instance variable as the superview of the MovieGLView in the DJIVideoPreviewer class to show the Video Stream first, then create a DJIBaseProduct object from the DJISDKManager and use an if statement to check its model property. If the product is A3, N3, Matrice 600 or Matrice 600 Pro, we invoke the addListener:withQueue: method of DJIVideoFeeder class to add DJICameraViewController as the listener of the secondaryVideoFeed for video feed, otherwise, we add DJICameraViewController as the listener of the primaryVideoFeed instance for video feed. Lastly, we invoke the start method of DJIVideoPreviewer instance to start the video decoding. Moreover, in the resetVideoPreview method, we invoke the unSetView method of DJIVideoPreviewer instance to remove the MovieGLView of the DJIVideoPreviewer class from the fpvPreviewView instance first. Then also check the current product's model using an if statement. If the product is A3, N3, Matrice 600 or Matrice 600 Pro, we invoke the removeListener: method of DJIVideoFeeder class to remove the DJICameraViewController listener from the secondaryVideoFeed for video feed, otherwise, we remove the DJICameraViewController listener from the primaryVideoFeed for video feed. Firstly, we create the - (DJICamera*) fetchCamera method to fetch the updated DJICamera object. Before we get the return DJICamera object, we need to check if the product object of DJISDKManager is kind of DJIAircraft of DJIHandheld class. Since the camera component of the aircraft or handheld device may be changed or disconnected, we need to fetch the camera object everytime we want to use it to ensure we get the correct camera object. Then invoke the setupVideoPreviewer method to setup the DJIVideoPreviewer in the productConnected delegate method. Lastly, reset the camera instance's delegate to nil and invoke the resetVideoPreview method to reset the videoPreviewer in the productDisconnected and viewWillDisappear methods. Here, we use the -(void)videoFeed:(DJIVideoFeed *)videoFeed didUpdateVideoData:(NSData *)videoData method to get the live H264 video feed data and send them to the DJIVideoPreviewer to decode. Moreover, the -(void) camera:(DJICamera*)camera didUpdateSystemState:(DJICameraSystemState*)systemState method is used to get the camera state from the camera on your aircraft. It will be invoked frequently, so you can update your user interface or camera settings accordingly here. 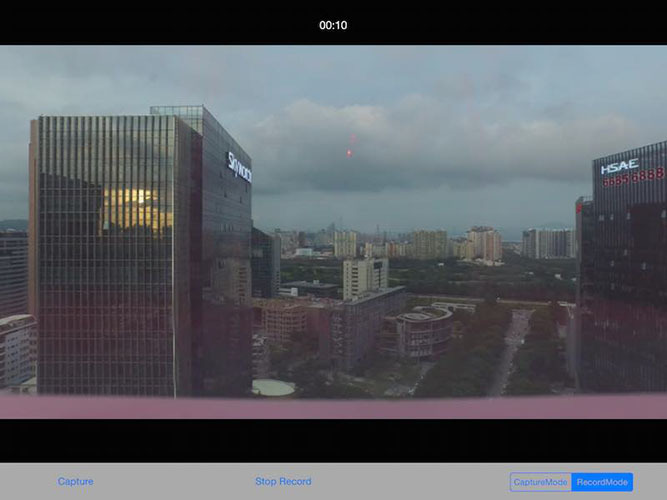 Please check this Connect Mobile Device and Run Application guide to run the application and view the live video stream from your DJI product's camera based on what we've finished of the application so far! If you can see the live video stream in the application, congratulations! Let's move forward. You can check the shoot photo result from the DJICompletionBlock. Build and run your project and then try the shoot photo function. If the screen flash after your press the Capture button, your capture fuction should work now. Before we implement the record function, we need to switch the camera work mode firstly. Let's check the DJICameraMode enum in DJICameraSettingsDef.h file. *  Capture mode. In this mode, the user can capture pictures. *  Record mode. In this mode, the user can record videos. *  Phantom 3 4K and  Osmo series. *  X5 camera nor X5R camera while  mounted on aircraft. *  change modes to `DJICameraModeRecordVideo`. Only supported by Inspire 2. *  The camera work mode is unknown. You can see from above that there are 5 types of DJICameraMode. Here we use the first two types. In the code above, we invoke the - (void)setMode:(DJICameraMode)mode withCompletion:(DJICompletionBlock)completion; method of DJICamera to change the camera mode. Here we add two UIAlertViews to show warnings when the user set DJICameraMode failed. Firstly, let's go to Main.storyboard and drag a UILabel on top of the screen, set up the Autolayout constraints for it and create an IBOutlet named currentRecordTimeLabel in the DJICameraViewController.m file. Then add a BOOL variable isRecording in the class extension part of DJICameraViewController. Be sure to hide the currentRecordTimeLabel in the viewDidLoad method. In the code above, we implement the startRecordVideoWithCompletion and stopRecordVideoWithCompletion methods of the DJICamera class based on the isRecording property value. And show an alertView when an error occurs. Congratulations! Your Aerial FPV iOS app is complete, you can now use this app to control the camera of your Mavic Pro. 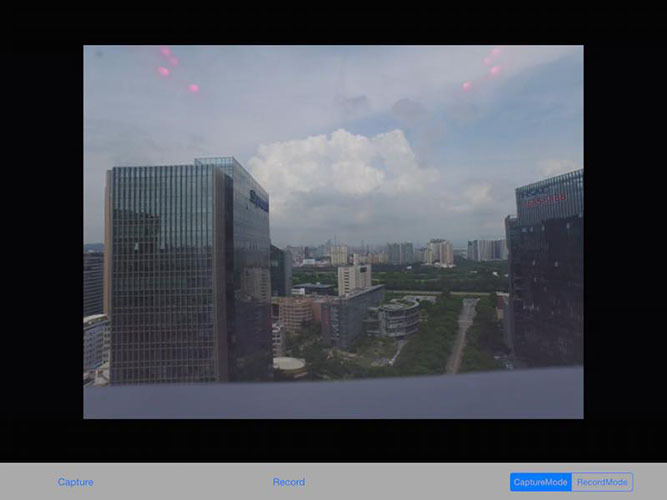 In this tutorial, you’ve learned how to use DJI Mobile SDK to show the FPV View from the aircraft's camera and control the camera of DJI's Aircraft to shoot photo and record video. 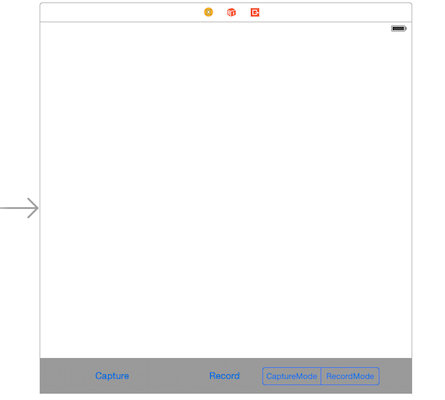 These are the most basic and common features in a typical drone mobile app: Capture and Record. However, if you want to create a drone app which is more fancy, you still have a long way to go. More advanced features should be implemented, including previewing the photo and video in the SD Card, showing the OSD data of the aircraft and so on. Hope you enjoy this tutorial, and stay tuned for our next one!